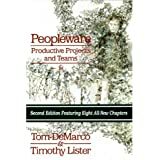 The always interesting blog Cool Tools recommended a book called Peopleware . The book describes just how screwed up managers and management processes tend to be at software companies. The book basically states that most software companies focus so much on the product, process, and bottom line that their projects usually fail. Why? The companies neglect to take care of the most important part of the development process: The developers themselves. Reading the book was torturous, but not because the book was poorly written or out of touch with reality (as so many management books are). Rather, it was 200+ pages of descriptions of poor management decisions and bad processes that made me say, after almost every page, "sheesh, my company does exactly that!" After reading many development and management books (usually as required reading for some corporate training exercise), I found that most of those books are 5% useful and 95% total garbage. Peopleware is exactly the opposite. It was also interesting to read the books Work to Live and Peopleware back-to-back. Reading Work to Live will make you rebellious. Reading Peopleware will make you angry.